The Wright Brothers | Triumph! 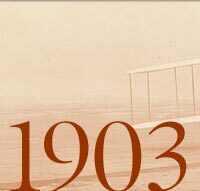 On December 14, three months after arriving at Kitty Hawk, the Wrights were finally ready to give their creation a try. They tossed a coin to determine which brother would make the first attempt. Wilbur won and climbed into the pilot’s position. Forty feet down the rail, the Flyer lurched up, stalled, and smashed into the sand, slightly damaging the forward elevator. This is one of two pictures showing the Wright Flyer in the air. With damage repaired, the Flyer was again ready for flight on December 17. The Wrights arose that morning to freezing temperatures and a 27-mile-per-hour wind. At 10:35 a.m., the Flyer lifted off the launching rail with Orville at the controls. The overly sensitive elevator control caused the Flyer to dart up and down as it sailed slowly over the sand, coming to rest with a thud 120 feet from where it had taken off. The flight was short—only 12 seconds—but it was a true flight nevertheless. A human had flown. The Wrights used this stopwatch to time the Kitty Hawk flights. The Wrights sent home this telegram confirming their success. Just after this picture was taken, as the brothers and the local observers discussed the fourth flight, a gust of wind overturned the airplane and sent it tumbling across the sand. Severely damaged, the 1903 Wright Flyer never flew again. The experiments for that year were over, but the Wrights had accomplished what they had set out to do. This is the only other picture of the Wright Flyer in the air. It captures Orville landing at the end of the third flight. The Wright brothers made three more flights that day. On the second, Wilbur traveled 175 feet in a similar up-and-down course. On the third, Orville covered a little more than 200 feet in 15 seconds. With Wilbur back at the controls, the Flyer made its final and most significant flight. After another erratic start, Wilbur steadied the airplane for an impressive 852-foot trip in 59 seconds, definitively demonstrating that the Wright Flyer was capable of sustained, controlled flight.